Anglican, Bothwell, crenellation, finial, Gothic, Gothic Revival, Alfred Ibbott, lancet window, memorial, parapet, pointed arch, Romanesque, St Michael and All Angels Church, Tas, Tasmania. 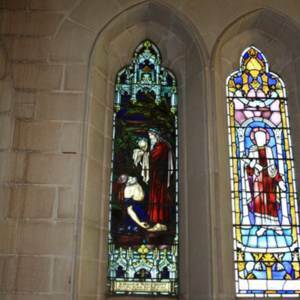 The Alfred Ibbott (1844-1928) memorial window is in St Michael and All Angels Anglican Church in the Tasmanian town of Bothwell. The window (on the left in the photograph) is one of two lancet windows parrallel. The figures are framed by a representation of elaborate Gothic stonework with columns, pointed finials, pointed arches, and a crenelated parapet in the upper section. The more recent window on the right includes a Romanesque semi-circular arch. Alfred Ibbott, Anglican, Bothwell, crenellation, finial, Gothic, Gothic Revival, lancet window, memorial, parapet, pointed arch, Romanesque, St Michael and All Angels Church, Tas, Tasmania. 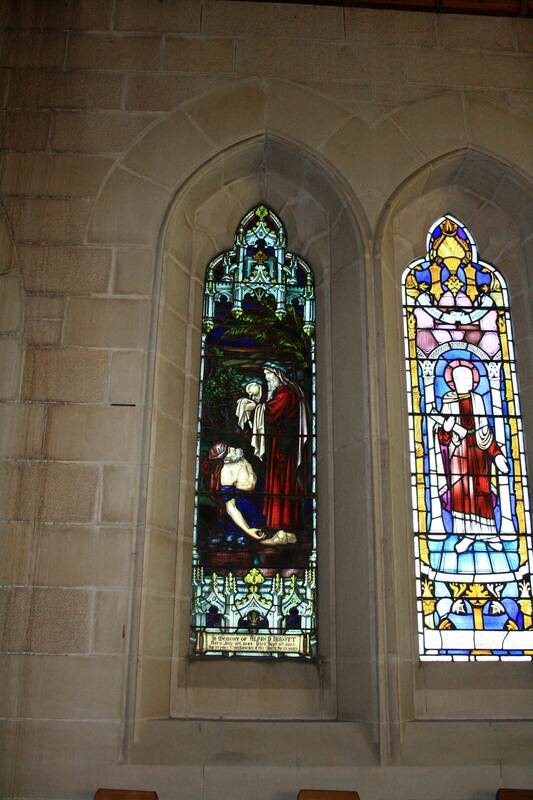 “Alfred Ibbott memorial window, St Michael and All Angels Anglican Church, Bothwell, Tasmania,” Medievalism in Australian Cultural Memory, accessed April 25, 2019, http://ausmed.arts.uwa.edu.au/items/show/1194.